Most recent update: After hours of contemplation, Dewhurst declared that the vote happened after midnight and is invalid. 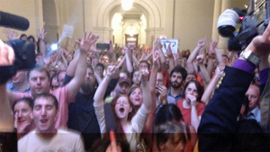 Dewhurst blamed the unruly occupy-acting mob and the Straus House leadership for the failure of the bill. From what I understand, what happened was that the pro-life bill was not able to be voted on in time because the mob was creating a disturbance. Straus comes in the picture because he killed it in the regular session and then he scheduled it for the very end of the Special Session. Dewhurst hinted that Governor Perry will call a second Special Session to pass the pro-life bill. The reason that there is uncertainty about the vote is due to the pro-death, I mean pro-choice, mob that was in the Texas State Senate Chamber screaming and banging on things to make noise to try to disrupt the procedures. This mob acted in a shameful, illegal manner and had to be kicked out by the police. There is absolutely NO RIGHT for someone, no matter what side they are on, to be able to disrupt a vote of the Texas Legislature. These people should have been removed much sooner when they first started to become disruptive instead of them being allowed to be in the chamber screaming until the stroke of midnight so that it was hard to even take the final vote. The situation was so crazy and tense that at one point the live stream of the Texas Senate Abortion Debate reached over 110,000 viewers at one time. I am not sure what the Democrats and pro-abortion activists thought they were going to accomplish. Pro-life Texas Governor Rick Perry would have just called a second special session and the bill would have passed anyway. This bill should have NEVER had to go to Special Session. It should have been passed in regular session but Speaker Joe Straus killed It in regular session and pushed it to the end of the Special Session. The only reason that the pro-life bill even had to go down to the wire in a Special Session is because Texas Speaker Joe Straus KILLED all pro-life bills in the regular session. That is right, the Texas Senate was able to have time to debate and pass several pro-life bills in the regular session. These bills were sent to the Texas House where they would have EASILY passed the near super-majority Republican body. The problem is that the pro-choice Speaker Joe Straus did not allow his leadership to let the bills out of committee. They never even made it to the floor for a vote. Joe Straus cut the Special Session short a few days by sending the legislators home, even though Straus knew the Special Session was short and knew that these pro-life bills would be added by Perry. Straus then went on to schedule the pro-life bills at the very end of the Special Session knowing that the pro-life bills, when passed by the House, would still need to go back to the Senate to be approved with little time left and with a much stronger Democrat presence in the Senate. What Was Passed in the Pro-Life Bill SB5?